It’s been more than awhile since I last wrote. I lost a job, or rather more aptly, gave it up. To get there, I had a bust up with my so-called investors; tested positive for benzodiazepine, a prescription drug that’s supposed to calm you down which worked me all up. It got me locked up in Thimphu’s ever houseful-slammer for five nights/six days (definitely not an itinerary to be promoted! ), and finally managed to read Shantaram (in the perfect environ). I bailed out and now here I sit in this bed in the unforgiving New Delhi heat, in a popular patch called Paharganj, which sits in an alley called Arakashan Road, in a hotel called The Grand Godwin- a luxury considering the concrete floor I was incarcerated in just a few days back. But don’t let those fancy hotel names fool you, Indians just love the majestic. The hustle and bustle of Delhi’s neon-lit underbelly and the everyday play of its entwined Yin and Yang expressions strike and stay deeply embedded in the mind, screaming to be heard, in all its confounding avatars. Yet the memory of these last hurly burly couple of weeks seem to give way, rather pleasantly with a sense of melancholia that only the wilderness can provide, to the Thimphu-Trongsa-Langtel-Trongsa-Bumthang-Punakha-Thimphu ride with the Bhutan Dragons Motorcycle Club. It was the best ride I’d had with the dragons, for reasons personal, professional and altruistic. I’d depriotized my rides with the club and realized, somewhere on the high misty roads, what a blunder I’d made and swore never to make that mistake. The silhouetted outlines of the central mountains nodded in agreement, as did the roar of my fellow bikers. 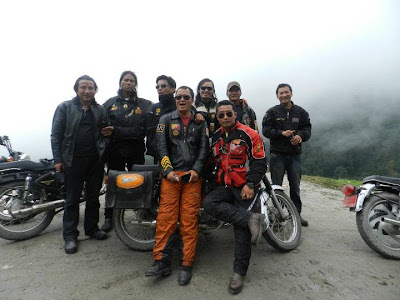 The focus of the ride this time were a handful of poor landless villagers, mostly elders, living in Langthel, a village situated some 30km south of Trongsa enroute to Zhemgang, one of the most impoverished districts in the kingdom’s central belt. Destitute destinations with faces that ache your hearts, a sight the members are all too familiar with. The irony is that the members always feel like they have gotten back more than what they’d given, though it would seem the riders were the harbingers of some good fortune. Go figure this out is the underlying mystical message and you realize there is nothing to figure out because logic has no context here. The fact that these folks are happy, and the bearers of these little gestures are happy is enough to quell that query. This probably enunciates what the Zen of traveling is all about; you never know, and on the road, the unknown is what you remember the most. When spontaneous combustion takes over, all you can do is surrender and go with the flow. Some weeks on and I’m back from Delhi’s belly, lying in bed in the capital that has been feverish with the celebrations of the wedding of His Majesty the King Jigme Khesar Namgyel Wangchuck to Queen Jetsun Pema. Back to reality and the dawn’s cracks with my pigeons and other assorted seasonal birds in the attic twittering the coming of October 18– nothing special in that date, except for the fact that on October 17, which was yesterday, my mates and co-members at the Bhutan Dragons Motorcycle Club made their journey to Paro from the club’s headquarters in Thimphu, to mark the third anniversary of the foundation of the club. And here I was again! Back home and in bed! Trying to battle out the Arakashan food poisoning I came back with! You see, as delicious as those Mughal wares are by the roadside dhabas (makeshift hotels) in Delhi, an unaccustomed stomach can go through a lot when you are at long last done with the chicken tikkas and tandooris, and the resulting scenario is a couple of days in bed, with the loo at a very accessible point. So even as I lay in bed for the umpteenth time, I was well aware of the significance of the day and what I was missing. The sad and unfortunate day was further compounded when I did get up with all my might (now befallen to a mere 57Kg from a healthy 65Kg just a fortnight ago) and made it to Nobu, the club’s official HQ in Thimphu. The place was as empty as my constitution. Yet there was a flicker of hope burning from inside Nobu. I got out of my rickety car as gingerly as possible, as if the gingerness would make the emptiness less burdensome. The sign on the window said, “Open” – giving me a faint hope of pessimistic optimism. I swerved the main door open, and to my fears, saw the dim lights throwing sad shadows on the empty pool and snooker tables. The stage to my left was barren. The bar was eerily empty. And from the sitting lounge a voice said, almost mockingly and mirroring my inner turmoil, “Jurmi, you didn’t go for the ride?” That did it, and with that, I went into a weak monologue of how I couldn’t make it as Delhi had poisoned me with food, robbing me of the pleasures and the camaraderie of being with my mates and fellow dragons to celebrate what was a momentous anniversary celebrating three satisfying years of loving to ride; riding to love and in-between pit stops, bringing whatever help the dragons could; to those that would seem destitute and poverty stricken, but have yet the power and that human magic, of making us all better human beings. 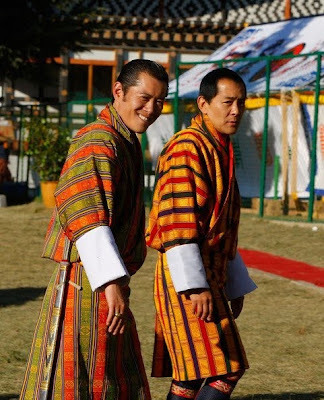 In 2008, a whirlwind of change swept through the tiny Kingdome of Bhutan. The change was as silent as the mountains that stand sentinel over the kingdom. It was welcomed with open arms and warm hearts. It was a national celebration, unprecedented and unrivaled anywhere in the world, as a new and dynamic crown prince was enthroned the fifth Dragon King on the eve of the centennial year of the Wangchuck dynasty. The coronation saw the emergence of several bodies and organization, all intended to commemorate the great event of the coronation of a young and dynamic king. The missions and visions shared a common factor – to keep alive the memory of 2008 for posterity. Authors flourished, with books, songs and dances and the renovation and dedication of religious and other important edifices. That apart, a small band of brothers in arms also wanted to contribute in their unique and ingenious way. It was motorcycle philanthropy, conceived and crafted in ways that further surmount the uniqueness of Bhutan. This was not about boisterous young boys tearing up the asphalt or pot-bellied beer guzzlers roaring through the countryside. 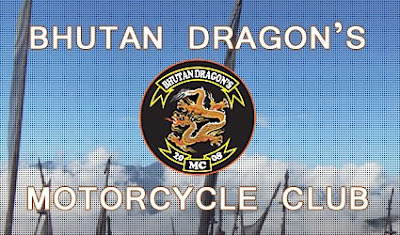 This was the Bhutan Dragons Motorcycle Club, the first of its kind. 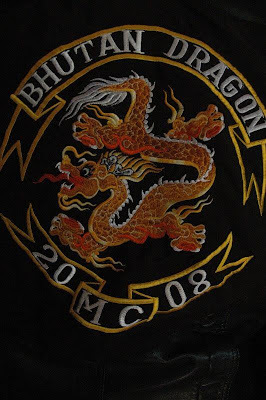 The dragon signifies not just the nation but also the responsibility that it entails, as set by the nation's leaders. The club, and not gang, as members are quick to point out, was established with a simple purpose but one that was designed to contribute something meaningful, no matter how small, to the needy. This was about purposeful riding – this was Zen and the Art of Motorcycle Maintenance, if you will. 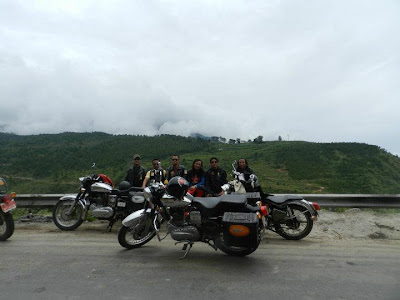 A motorcycle is every kid’s dream and Bhutan is no different, as horses gradually gave way to paved roads. The thrill of that throbbing pulsation in between the legs however ebbs with time and age. Not to mention career, wife and kids. But this was more than just sweeping the ever-twisting solitary highways. 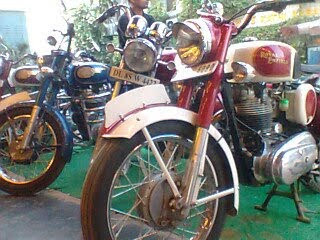 It was about bringing a common passion in the form of the Royal Enfield Bullet Motorcycles back to the fold. 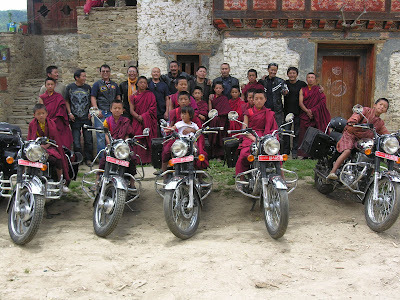 In the Bhutanese context, a motorcycle club may sound strange. But this was again part and parcel of the changing Bhutanese landscape. The important factor was incorporating this love unto the bigger picture – of a nation in the pursuit of Gross National Happiness. The club is about preserving the sanctity of the past, encapsulating the present and envisaging the needs of the future. Its vision is as wholesome as the goal of the nation. It is more than the club slogan of ‘Love to Ride, Ride to Love,’ with a desire to spread a small measure of happiness on wheel power. And so how did the Bhutan Dragons Motorcycle Club come about? The concept was well received by friends more than eager to throw in their lots. The brainchild of a few grew dramatically, leading to the formal establishment of the club. Structurally, a chairman of repute was appointed with the club run by a president, and the rides controlled by a front and flank man. Membership is not open to everyone and stringent rules ensure that the club lives up to its reputation. Members who fit the bill are formally initiated into the club through a religious ceremony. This done, they can proudly don the club insignia and also have riding initials of their choice on their jackets. 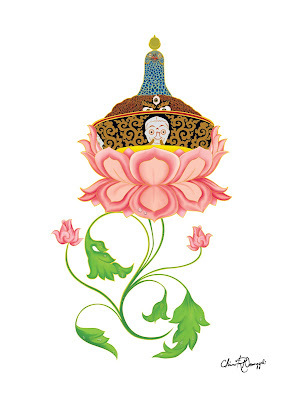 At present, there are two clubhouses, one in Thimphu and another in Paro. 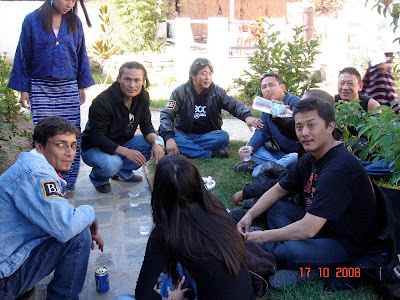 Thus on October 17, 2008, the riders kick-started their machines from the Thimphu club house, the club’s HQ now called Nobu, for the first initiation ceremony that was held in Paro. Motorists and passerby watched bewildered as more than fifteen motorcycles roared through town and country at a respectable pace. The club’s motto is not to shock but to stealthily steal their way into the hearts of the people. 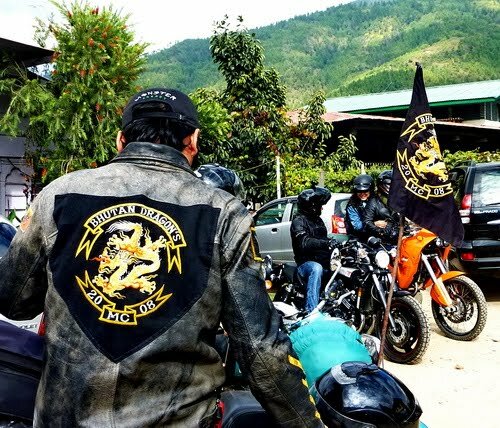 A small group of riders from the Paro Chapter welcomed the team halfway and escorted them to the clubhouse, where preparations for the elaborate initiation ceremony were in hasty progress. The ceremony was not about the last man standing after a boozing daredevilry. Rather, it was maroon–clad monks who performed a religious ceremony for club’s goodwill. The ceremony required the initiates to take oaths to abide by the club’s charter. The chairman, Dasho Ugyen Tshechup Dorji, a prominent member of the business community and a huge supporter of philanthropic endeavors then presented the ceremonial white scarves. The chairman had nothing but words of encouragement for conceiving such a venture and his personal support and assistance in that light. 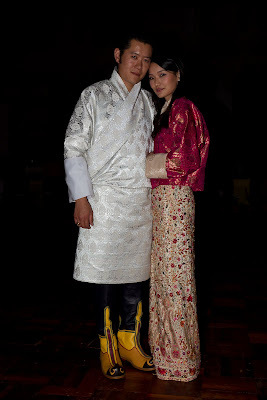 Bhutan being Bhutan, an occasion would not go bereft of parties, hence the ceremony was followed by a lavish feast, complete with song and dance. The riders were more than happy to stretch their legs to keep abreast with the local dancers. The merriment went well into the night, but the riders had to grab some sleep from the mission ahead, a pinnacle climb to a monastery on a steep ridge. It is the mission actually upon which the club is grounded. And the first one did call for some daredevilry. Early the next morning, the riders took on a steep rough road that would compete with X-Sports. The destination was a beautiful traditional temple perched on the promontory of a vertical hill some 45 minutes up in the clouds. The ride was grueling and nerve-racking, but this was the path the club had chosen and so it was. The ride must go on. Up atop the hill, outside the temple, young monks gazed down the trail, hoping to catch a glimpse reminiscent of Spielberg’s Encounters of the Third Kind. The serpentine trail was made in hell but once the pinnacle was mounted, it was all made in heaven! The caretaker and the young monks and novices had prepared a modest luncheon, and at that altitude and with all that energy spent, the food was ambrosia. Member then offered prayers in the monastery’s inner sanctums and work on the mission began in earnest. Mindful of the high altitude and the biting winter creeping in, the club had brought warm jackets for the young novitiates. It was hard not to notice the sense of joy and gratitude as they received the unexpected gifts. 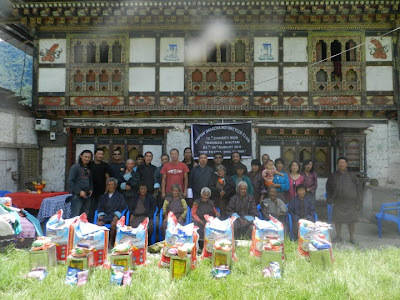 The caretaker said he was rather surprised by motorcyclists bearing gifts for his monks but extremely grateful for the good work they were doing. Mission accomplished, the riders made the trip back, some barely managing the unforgiving gradient. But the back up plan always does the trick, picking up the errant befallen bikers and their wounded horses. It’s been now twelve rides around the kingdom’s boondocks, and the number of new initiates wanting to turn dragons keep increasing by the day, a trend all the dragons are proud of. 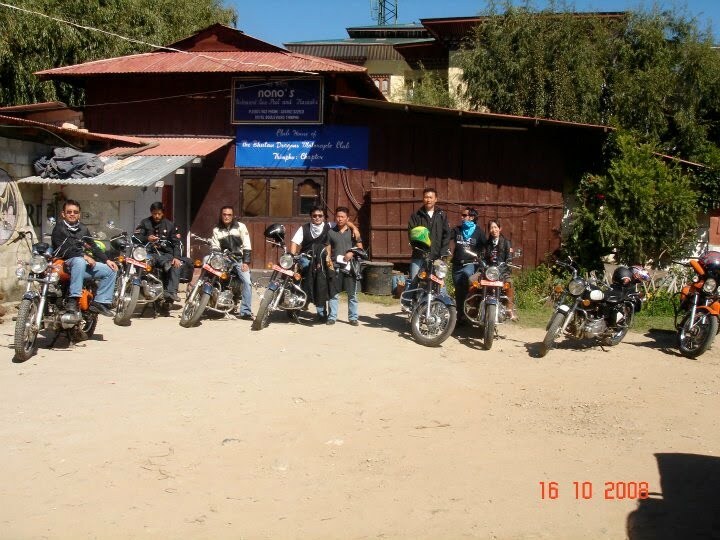 *The club’s 13th charity ride is in December to Trashi Yangtse, another far-flung district in the eastern boondocks. The way the dragons see it, when it ends, it begins anew. Update: The club has now 52 members and two international chapters in Australia and Germany. RC Peter heads the German Chapter and James Irving heads the Aussie Chapter. And jolly good news for Enfield enthusiasts; there is now an official Enfield dealer in Thimphu called Leksol Automobile. The club’s chairman is Dasho Ugyen Tshechup Dorji and the President is Pale Rider. 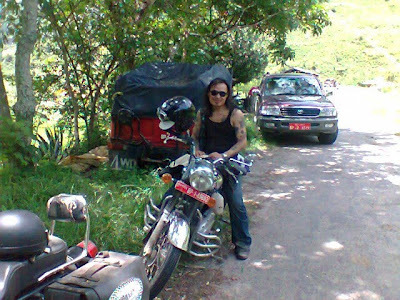 *Jurmi Chhowing aka Toxic Rider is a freelance writer and the proprietor of Turtle Tree Creations, a multimedia Ad agency. He can be reached at (iamdrukpa@gmail.com) .